In 1997, biochemist and blood clotting expert Russell Doolittle wrote an article (http://www.bostonreview.net/br22.1/doolittle.html) in the Boston Review that criticized Michael Behe's concept of Irreducible Complexity, and Behe's account of the clotting system as IC. Behe has claimed (http://www.discovery.org/scripts/viewDB/index.php?command=view&program=CSC%20Responses&id=1214) that the article was in error, and since then Behe has brought up Doolittles alleged "mistake" several times. Most recently, on 16 February 2005, Dr. Vincent Cassone debated Intelligent Design advocate Dr. Michael Behe. The debate was sponsored by the TAMU Veritas Forum. "Behe ... Brings up the clotting cascade, and points out an error made by Russ Doolittle in a Boston Review article in 1997. Doolittle mischaracterized a 1996 paper on double knockout mice lacking two proteins in the clotting cascade. Behe introduces a theme for the evening: if Russ Doolittle, the world's expert, makes mistakes about the clotting cascade, then there is no evidence that it arose by DEM." So, again, Behe has brought up Doolittles alleged "mistake" several times. Would it surprise you that Behe is being less than forthright? Well, aside from Behe's flawed logic in that quote (assuming Behe was correctly reported), here is what Russ actually said in the Boston Review article. This is near the end of a longish article. Now, let's be clear what Doolittle is stating here. 2) The example shows that simpler systems than the full system can work in laboratory situations. Behe has responded to Doolittle in several fora, saying he made a mistake. In this article Behe, quotes part of the paragraph. Behe carries on as if Doolittle thought these mice were exactly the same as wild-type mice in all respects. However, Behe omits the last section of Doolittle's paragraph, with its qualifications and statement that these mice are by no means identical to ordinary mice and wouldn't survive in the wild. At the most Doolittle is guilty of using jargon (compromised rather than die; however, researchers still tend to write that animals were sacrificed, rather than animlas were killed, when describing experiments). It is Behe who is doing the mischaracterizing, not Doolittle. Now, I've read Bugge et al, and I think Behe's statement not only mischaracterizes Doolittle, but also mischaracterizes the Bugge et al. paper. Note that this is the critical final step in clotting. 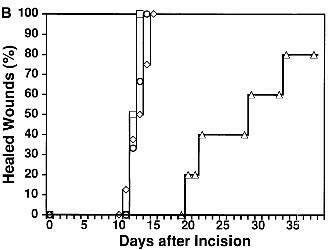 Now, what happens when we knockout the gene for fibrinogen, making the mice unable to form fibrin (and hence clots)? Nothing much really. 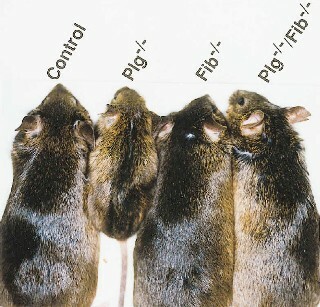 In the laboratory the fibrinogen knockout mice (Fib-/-) live normal lives with minor defects. They can't carry a pregnancy beyond mid-term, but they should be dead from massive bleeding a day or two after birth, not living well into breeding age. The reason is that the clotting system not only stops bleeding from cuts and wounds, it also maintains the integrity of the blood vessels. Without a low level of clotting activity, the blood vessels (mostly the small ones) leak [note1]. These animals have a low-pressure blood circulation system and use circulating haemocytes (a bit like white blood cells) to plug up any wounds. I'd like to emphasize that the vertebrate clotting system did not evolve in modern mammals with high-pressure circulatory systems, but developed between the tunicates (which have no readily identifiable components of the modern coagulation system) and cartilaginous-jawed fish (which have most of the pathways). It can be readily seen that a generalized "globbing system", well short of the modern coagulation system would be an advantage over the tunicate hemolymph system, with out requiring the specificity of the modern vertebrate coagulation system [note2]. When the blood vessel is repaired the fibrin has to be cleared away, this is performed largely by plasmin, generated from its inactive precursor, plasminogen. This is part of the balanced "Yin/Yang" system that Doolittle talks about. Plasminogen knockout mice (Pl-/-) have no plasminogen. The Pl(-/-) mice are very sick. They fail to gain weight, have very poor wound healing, have numerous pathological changes and all die within 300 days . So what happens when we knock out both plasminogen and fibrinogen? With both of these essential components gone the mice should be even sicker, right? Wrong! Plasminogen/Fibrinogen double knockouts gain weight almost at the rate normal mice do, have wound healing almost indistinguishable from normal mice and live for virtually the same time as normal animals. They do have a few pathological changes, but as Doolittle says, "for all practical purposes" these animal are normal (see the following figures, they are pretty amazing). Wound healing, the plasminogen knockout mice (triangles) heal very slowly, while the Pl(-/-),Fib(-/-) mice (diamonds) not only fail to bleed to death immediately, but heal almost as fast as normal mice (squares). Now, let me emphasize again that these animals fail to bleed to death catastrophically or do any of the horrible things that one would expect from Behe's "irreducibly complex" scenario. As Doolittle says, this shows the Yin/Yan aspect of coagulation, with checks and balances that can be built up step by step. Now, fibrinogen knockout mice cannot carry a pregnancy beyond day 10, neither can the double knockout mice. This is not particularly significant when by Behe's ideas these mice should be dead shortly after birth, but conspicuously aren't. In the wild, they wouldn't be able to breed, but in the wild they would be dead long before breeding age. The way Doolittle frames his brief discussion, given the limitations of a newspaper article ("No one doubts that mice deprived of these two genes would be compromised in the wild") is perfectly compatible with the facts of the Bugge et al., paper. "They [the double knockout mice] are decidedly not promising evolutionary intermediates." Doolittle never claimed they were ("No one doubts that mice deprived of these two genes would be compromised in the wild"), after all clotting evolved in protovertberates with low-pressure blood systems, not modern vertebrates [3, 4]. What Doolittle was pointing to was how the systems interact with each other, and how systems could be built up piecemeal. 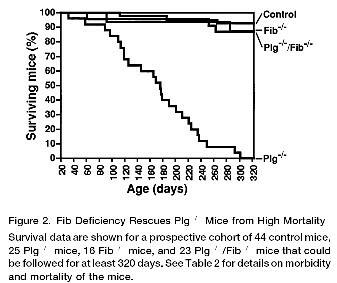 Behe seizes on a minor point, only made possible by not quoting the full text of Doolittle's paragraph, and ignores the fact that fibrinogen deficient mice don't bleed to death immediately after birth, as his scheme would predict. This is not the only thing he has ignored. Miller has pointed out to Behe that whales and dolphins lack the contact pathway (Factor XII or Hageman Factor) . Furthermore, puffer fish don't have the pathway either . So two groups of vertebrates can live happily without a major arm of the clotting cascade. Behe has not addressed this. This is a larger omission than Doolittle's. In summary, Behe misrepresents Doolittle. Basic courtesy would at least require Behe to include the full Doolittle paragraph in his article, let alone ceasing to claim Doolittle "made a mistake." [note 3]. Bugge et al., "Loss of Fibrinogen Rescues Mice from the Pleiotropic Effects of Plasminogen Deficiency." Cell 87 (1996): 709-19. Camerer E, Duong DN, Hamilton JR, Coughlin SR. Combined deficiency of protease-activated receptor-4 and fibrinogen recapitulates the hemostatic defect but not the embryonic lethality of prothrombin deficiency. [note1] Thrombin knockout mice are embryonic lethal. However, it turns out that thrombin leads a double life as an embryonic tissue remodelling enzyme. It is entirely possible that thromin was co-opted from development remodelling enzymes. There is a lot of evidence that he complement system originated by co-opting tissue remodelling enzymes. [note2] While its is easy to imagine a trypsin like enzyme chopping bits off previously soluble protein to make it insoluble, making a protoclot, one issue that has been raised is how do you stop this primitive trypsin-like enzyme from clotting the entire blood, rather than where it is needed. A clue comes from the primitive chordate Amphioxis. It has trypsin circulating in its haemolymph (it doesn't have blood like vertebrates), when the animal is injured, trypsin cleaves a bit off an enzyme activating it, which in turn produces a polymeric melanin which acts as a kind of glue to immobilize bacteria. Why isn't trypsin activating this enzyme all the time? Trypsin is only activated in the presence of calcium released by tissue damage. This is a primitive, one step version of the calcium-activated clotting cascade. Pang Q, Zhang S, Wang C, Shi X, Sun Y. Presence of prophenoloxidase in the humoral fluid of amphioxus Branchiostoma belcheri tsingtauense. Fish Shellfish Immunol. 2004 Nov;17(5):477-87. [note 3] At least one other webpage has Behe partly quoting Doolittle's statement and omitting the qualifier, as well as proceeding as if the qualifier wasn't there. Behe also repeats it often in lectures and talks. "Soon after the book was published, its thesis was challenged by the leading expert in America on cell structure, Dr. Russell Doolittle at the University of California. He cited a scientific study supposedly disproving irreducible complexity. Behe immediately researched it and found it proved just the opposite: It confirmed him. So Behe went back to Dolittle. In a phone conversation, Doolittle admitted he was wrong, but he has never made a public retraction." "Thanks for sending me the latest on the desperate tactics that these people avail themselves of. Others have written me in the past about my alleged "concession." What happened is that Behe emailed me after my article appeared and challenged my tail-end assertion about the Bugge et al paper. I went back and read it more carefully, and indeed, I had overstated one aspect. It was inadvertant, and I apologized. Ah, rue the day with minds like theirs! In my paper I raised the point of how mice without plasminogen were severely ill. Mice without fibrinogen are also unwell, although not as badly off as the plasminogen-lackers. However, the big point was that mice lacking both genes were considerably better off than the ones that only lacked plasminogen. I had said these mice were "..for all practical purposes..normal," although I went on to qualify the statement about how the mice would doubtless be compromised in the wild. In fact, the paper makes it clear that the mice are not "normal" in that they don't breed well, even though the individuals are not unwell. My original point, lost in all the persiflage, was that there is a "point and counterpoint" in the evolution of these two genes, as there is in the evolution of many interacting systems. It's truly annoying that the creationists ("Intelligent Designers") get so much mileage out these side-issues and refuse to confront the main message. Web resources on the evolution of clotting. (Mark Perakh's posts at www.talkreason.org/articles/Behe2.cfm and www.talkreason.org/articles/Suboptimal.cfm complement these references. TR).